I grew up watching the “Price is Right.” Long before Netflix and “on demand” television programming, all of America watched the same shows at the same time — regardless of age or interest. So, if I found myself home sick from school, or enjoying a summer weekday morning watching television at 10AM on CBS, I was watching a showcase showdown refereed by Bob Barker. Some of you know what I am talking about. Before they could ever compete on the higher levels of the show, contestants would join a lineup of several people who would estimate the cost of an individual item. The one closest to the price of the item (without going over) would win the prize and get to compete for the bigger prizes. Most contestants would try to estimate the exact price of the item up for grabs. If the item really cost $800, people would guess $650 or $850 trying to win it. Occasionally though, someone would try to win the prize by lowballing their estimate at $1. If everyone else overestimated their value, then someone could win the prize with a $1 bid, because at that low cost . . . they had no way of “going over” the price of the prize. In Romans 12:3 Paul says, “For by the grace given to me I say to everyone among you not to estimate himself more highly than he ought to estimate, but to estimate with the right price, each according to the measure of faith that God has assigned.” Sadly, many of us struggle with thinking of ourselves more highly than we should. This is the root of so many human maladies, including racism, pride, and self-centered behavior. Some of our self estimations go over our true value. Others estimate our value at merely $1 . . . feeling we have nothing to add. In either case, we are determining our value based on comparisons with others in an unhealthy way. Paul calls believer’s in Jesus Christ to give a true estimation of themselves. We are not to overestimate our value in relation to others, or to underestimate it, feeling we have nothing to add. Instead, we are to measure our lives by faith, according to Gospel truth, which demonstrates our equality with all believers, yet our diversity in gifting. 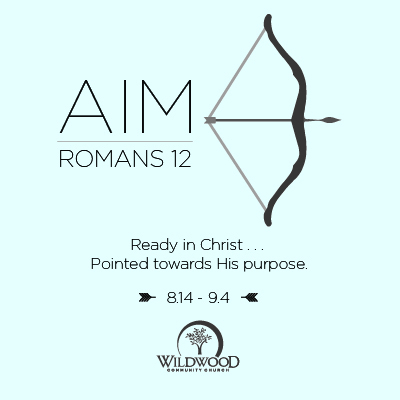 Join us this Sunday at Wildwood Community Church in our 8:30, 9:45, or 11:00 worship service as we get a fair estimate of our lives and realize what God is doing through us together in part 2 of the “Aim” sermon series. See you Sunday . . . and invite your friends!